I am a doctor but quite frankly, as a man, I have no idea what premenstrual syndrome (PMS) really feels like. I understand, and have been told by my wife, that it can be an uncomfortable or even a miserable experience that can impact your work and social life. PMS can affect not only you and your lifestyle, but the people around you who you love and love you. These symptoms can leave women looking for a safe and effective form of relief. Chasteberry is a natural supplement that has been scientifically shown to be effective in helping to ease PMS symptoms. Unfortunately, many are not aware of this scientifically proven, safe, and natural option. As most women can explain, PMS is a collection of symptoms that occur about a week before a woman’s period. The intensity of PMS varies from woman to woman; some experience only mild uncomfortableness while others find it to be quite debilitating. PMS includes physical, emotional, and behavioral symptoms. The most common physical symptoms include bloating and weight gain, fatigue, headaches, cramps, breast tenderness, insomnia, and constipation. Mood and behavior symptoms are typically feelings of sadness or depression, anger and irritability, anxiety, and mood swings. Increased ratios of the hormones estrogen and progesterone are the most common reason for PMS symptoms, and most treatments focus on ensuring hormone levels are properly balanced. For those who seek natural remedies for their health concerns, chasteberry has emerged as a go-to PMS solution without the common side effects of many other treatments. But what is chasteberry, and how does it work? Also known as vitex or agnus-castus, chasteberry is the fruit of the chaste tree and is a member of the mint family. Chasteberry has been used for centuries as a folk medicine supplement for improving reproductive health. The famous Greek physician Hippocrates, who many consider the founder of medicine as a rational science, was one of the first to discover its particular benefits for women. He believed that the chief role of the physician was to aid the natural resistance of the body to overcome imbalances and restore health and harmony. Hippocrates passed away in 370 B.C. but, over 2,000 years later, modern science has confirmed what Hippocrates thought all along – chasteberry can be very beneficial in helping women address the various symptoms of PMS. Agnuside, chasteberry’s most significant compound, is not found in other foods, but is only found in chasteberry as a health supplement. Chasteberry works to balance hormone levels, but it’s not a hormone itself. PMS symptoms are primarily caused by imbalances of female hormones and a major way that chasteberry is believed to work is by balancing the ratio of progesterone to estrogen by reducing the release of prolactin. Prolactin is a hormone suspected to contribute to irregular periods and certain PMS symptoms. A European Union study published in British Medical Journal found that chasteberry can improve both physical and mood/behavior PMS symptoms by over 50%! Such symptoms include irritability, anger, headache, breast fullness and bloating. The study was randomized, double blind and placebo controlled — so the patients didn’t know who was receiving the actual chasteberry and who was receiving the placebo. Those receiving the chasteberry reported 52% improvement of their symptoms after two cycles, which was corroborated by the physicians’ own evaluation. Since the study was double blind, the physicians themselves did not know who was taking the chasteberry or the placebo until the conclusion of the study — which reported only 24% improvement by the placebo. The science showed, above the 99% confidence level, that chasteberry was better than the placebo. The science also points to chasteberry being effective for the vast majority of PMS-sufferers. A study from Journal of Women’s Health & Gender-Based Medicine evaluated 1,634 PMS patients and gave them a questionnaire that evaluated the degree to which they experienced common PMS symptoms like depression, anxiety, and food cravings. After being treated with chasteberry through three menstrual cycles, 93% of patients reported either a decrease or complete termination of their symptoms. 94% of the patients reported little to no side effects from the treatment. Any other treatments to consider? For the mood-related symptoms of PMS, many women have turned to SSRIs (antidepressants such as Prozac® and Seraferm®) for help. Although these can be effective for some women, they do not address the hormonal imbalances that cause most of the physical symptoms. Also, the side effects for SSRIs include nausea, drowsiness, insomnia, and nervousness — so they may be counter-productive for many women. Hormonal contraceptives are another common PMS treatment and can address different symptoms than SSRIs do. But these also come with unpleasant side effects like breast tenderness, headaches, weight gain, and nausea, so they’re not a great fit for many. NSAIDs, like ibuprofen, can help with cramping and breast discomfort, but long term use can lead to other serious health issues like stomach bleeding. Midol® is a common drug for treating cramping as well, but besides containing an NSAID or acetameinophen to control pain (depending upon which type of Midol), it has as much caffeine as a cup of coffee and is incapable of helping with most other PMS symptoms. With the side effects and limitations of these options, it’s easy to see why chasteberry is gaining popularity as a natural solution that is both safe and effective. What are other natural ways to address PMS? Some evidence exists that increasing your total daily intake of calcium (1200-1500mg/day – preferably through your diet), magnesium (300-400mg/day), and vitamin B-6 (200mg/day) can help with PMS symptoms. Other popular natural PMS remedies include dandelion, dong quai, bupleurum root, milk thistle, and burdock root. While these have been used for centuries, it should be noted that they are lacking in high-quality scientific research to support their use for addressing PMS symptoms. Try to avoid sweets because they can cause changes in blood sugar that may make mood swings, headaches, and concentration issues worse. Similarly, try to reduce caffeine (which can worsen depression and anxiety) and salt (which can increase fluid retention and bloating). Lastly, women who exercise more tend to have milder PMS symptoms because exercise can increase the release of feel-good endorphins and reduce stress. If you’re a regular exerciser, just stick to your usual routine. If not, even a brisk walk through the park should being benefits. Which chasteberry supplements are best? 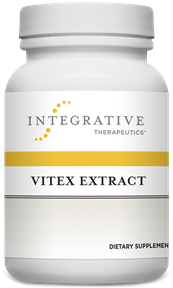 Those looking for a supplement that just contains high-quality chasteberry extract should consider a product like Vitex Extract by Integrative Therapeutics. Currently, the exact dosing for the treatment of PMS has not yet been determined, but most natural practitioners and reputable manufacturers recommend a dosing range between 200 – 300 mg/day. Be patient, though — symptom relief can take a little time, usually after dosing daily for 60 days. Note that, since chasteberry can affect hormone levels, you should not use it if you are pregnant or breastfeeding, have a hormone-sensitive condition such as breast cancer or endometriosis, or take birth control pills or use hormone replacements. Consult with your healthcare practitioner on its use. Those looking for a combination-type supplement of chasteberry and other nutrients should consider a product like PMS Support by Vital Nutrients or Chasteberry Plus by Metagenics. If you are not eating a carefully balanced diet or taking a well-rounded multivitamin, you may also want to consider a supplement that ensures you are getting enough calcium, magnesium, and vitamin B-6. While there is little hard science to support that increased calcium or magnesium improves PMS symptoms, there are many articles supporting such claims — which science may prove in time. ProSoothe II, by Pure Encapsulations, combines chasteberry with these important vitamins and minerals for comprehensive PMS support. I hope this information is useful to you and encourages you to consider chasteberry for PMS relief, and that you don’t let PMS affect your lifestyle. If you have any questions regarding the concepts discussed here or anything else, you can reach our customer service team at: customerservice@oakwaynaturals.com or you can call them at 888-460-3091. For those looking for a supplement that just contains high-quality chasteberry extract for PMS relief. The famous Greek physician Hippocrates, who many consider the founder of medicine as a rational science, was one of the first to discover its particular benefits for women. Modern science has now confirmed what Hippocrates thought all along – chasteberry can be very beneficial in helping women address the various symptoms of PMS. Agnuside, chasteberry’s most significant compound, is not found in other foods, but is only found in chasteberry as a health supplement. Chasteberry works to balance hormone levels, but it’s not a hormone itself. A European Union study published in British Medical Journal found that chasteberry can improve both physical and mood/behavior PMS symptoms by over 50%! Such symptoms include irritability, anger, headache, breast fullness and bloating. A study from Journal of Women’s Health & Gender-Based Medicine evaluated 1,634 PMS patients and gave them a questionnaire that evaluated the degree to which they experienced common PMS symptoms like depression, anxiety, and food cravings. After being treated with chasteberry through three menstrual cycles, 93% of patients reported either a decrease or complete termination of their symptoms. 94% of the patients reported little to no side effects from the treatment. For the mood-related symptoms of PMS, many women have turned to SSRI antidepressants for help. Although these can be effective for some women, they do not address the hormonal imbalances that cause most of the physical symptoms and can have many side effects. Hormonal contraceptives are another common PMS treatment and can address different symptoms than SSRIs do. But these also come with unpleasant side effects, so they’re not a great fit for many. NSAIDs, like ibuprofen, can help with cramping and breast discomfort, but long term use can lead to other serious health issues like stomach bleeding. Midol® also addresses cramping, but sometimes contains as much caffeine as a cup of coffee and is incapable of helping with most other PMS symptoms. Some evidence exists that increasing your total daily intake of calcium, magnesium, and vitamin B-6 can help with PMS symptoms. Other popular natural PMS remedies include dandelion, dong quai, bupleurum root, milk thistle, and burdock root, but these lack high-quality scientific research to support their use for addressing PMS symptoms. Try to avoid sweets because they can cause changes in blood sugar that may make mood swings, headaches, and concentration issues worse. Similarly, try to reduce caffeine and salt. Lastly, women who exercise more tend to have milder PMS symptoms. If you’re a regular exerciser, just stick to your usual routine. If not, even a brisk walk through the park should being benefits. Those looking for a combination-type supplement of chasteberry and other nutrients should consider a product like PMS Support by Vital Nutrients or Chasteberry Plus by Metagenics. If you are not eating a carefully balanced diet or taking a well-rounded multivitamin, you may also want to consider a supplement that ensures you are getting enough calcium, magnesium, and vitamin B-6. While there is little hard science to support that increased calcium or magnesium improves PMS symptoms, there are many articles supporting such claims — which science may prove in time. ProSoothe II, by Pure Encapsulations, combines chasteberry with these important vitamins and minerals for comprehensive PMS support.